Maintain your heat pump or furnace with help from an HVAC contractor in Douglass and Rose Hill KS, including Wichita, KS! Your search for a qualified HVAC contractor ends here. 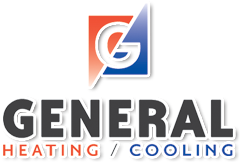 General Heating And Cooling, LLC installs and maintains HVAC systems at affordable prices. You can breathe a sigh of relief knowing that your heating and air conditioning systems are in our capable hands. If you notice anything irregular about your HVAC system, call an HVAC contractor in the Douglass, Rose Hill, Wichita, KS area right away. Our HVAC services save you from costly repairs in the future. When a problem arises, don’t wait for the temperature in your home to get unbearable before you reach out. Contact us immediately so we can get to work. All the equipment we install comes with a five-year warranty. You can also register for a 10-year warranty. Labor has a one-year warranty. Contact us now to get a free estimate on HVAC installation, repair or change-out services in Douglass, Rose Hill, Wichita, KS. As a family-owned business, we understand the importance of keeping your family comfortable. No one wants the people they care about to sweat through summer and shiver through winter. With over 20 years of experience, we have worked hard to keep families in the Wichita area comfortable. Call today to discuss your home air conditioning system with an HVAC contractor in Douglass and Rose Hill KS.